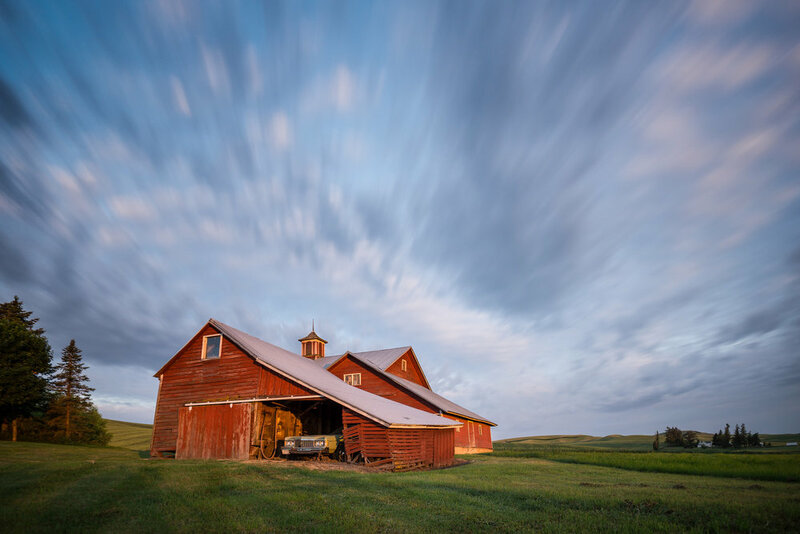 Join us for five days in the Palouse, an incredible region in eastern Washington State, with rolling hills filled with patterns of growing crops interspersed with rural barns and buildings and ever-changing skies. There really is no place like it in the world, a unique landscape formed by winds depositing silt from post ice age floods, creating a beautiful rolling rhythm to the landscape that is particularly friendly to the landscape photographer’s lens. The light and shadows play across the fields and hills, providing infinite combinations of compositions to pursue. 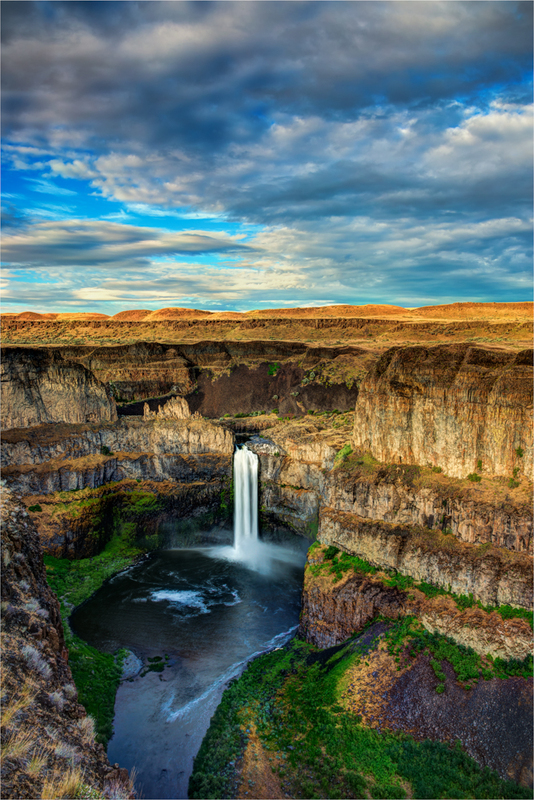 It is no wonder that the Palouse is now considered one of the top landscape photography destinations. We will also be visiting The Palouse Falls, another unique and beautiful post ice age formation which offers amazing landscape photography opportunities. A typical day in the field includes morning and afternoon/evening shooting in a variety of the best locations the Palouse has to offer, with a mid day break to recharge. While on site we will evaluate the day’s light and weather and discuss potential compositions and in-camera techniques to produce great imagery. During the midday hours, we will also have classroom sessions of post-processing workflow, digital file management, and working through selected RAW files using Lightroom, Photoshop, and various plugins. Muench Workshops operates on the principles of ethical and responsible landscape photography. We always have prior permission from landowners to shoot on private property. We are respectful of all fences, fields, crops, roads, children, pedestrians, and private barns and homes. We are guests in the Palouse, and will act accordingly. Images on this page are by Palouse ’15 guest Joseph Wu. Click here to see all of Joseph's great photos from The Palouse ’15. This video was made by one of our clients, Kevin Lisota, during our 2018 Palouse workshop. Our itinerary will be flexible, as we’ll choose our shooting locations based on weather and lighting conditions. One thing you can count on is variety. We will be visiting small, bucolic towns that were once profiled in the National Geographic, abandoned buildings and barns, beautiful sweeping scenes of rolling hills, as well as the more intimate surprises one always seems to encounter traversing the back roads of this area. A key area of focus during our time will be Steptoe Butte, a designated National Natural Landmark. 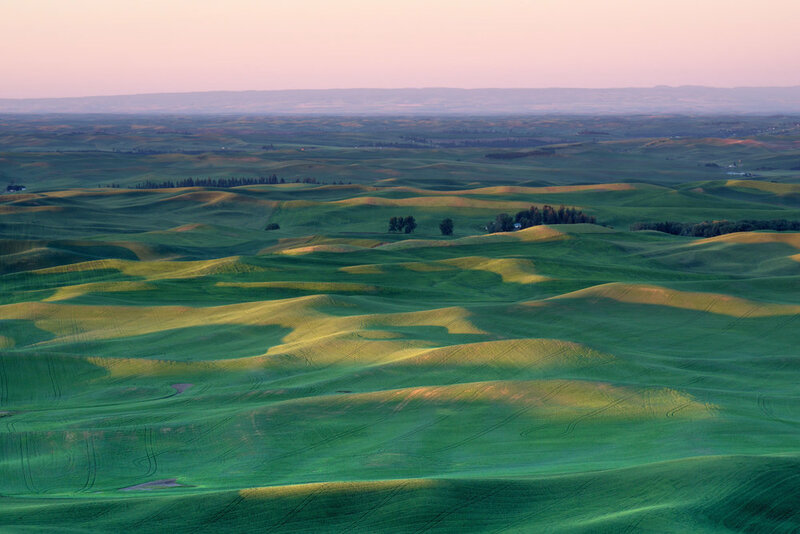 When you see spectacular shots of the Palouse that seem as if they were taken by air, often they were not, they were most likely taken from Steptoe Butte. A winding road to the summit offers numerous pullouts with a variety of elevations and views from which to create spectacular compositions. It can almost be overwhelming to approach these vistas from a compositional, light, and timing standpoint, but don’t worry, Randy and Mike will show you how to nail it. Our professionals have intimate knowledge of how to do this and are there to offer one-on-one assistance for all levels of participants. If time and conditions dictate, we may also visit Steptoe’s sister butte, Kamiak. Kamiak is a bit different, but depending on the year, can have spectacular wildflower displays at its summit. You can count on five days full of sweeping vistas, sunrises and sunsets, intimate details, and dramatic skies. We will have image reviews and post-processing instruction on three of the days. We have a new moon, so we should be able to get some really nice Milky Way shots in the evening! In addition to our list of what to bring, if you can bring a 300mm or up to 400mm lens (even longer) we“ll use them and teach “compressed telephoto” landscape shooting from Steptoe Butte! Travel Information: Fly to Seattle and drive, or fly all the way to Pullman, Washington (from Seattle) and there‘s a free shuttle bus to the hotel. We‘ll meet at 3:00 PM on June 2, 2019, in the lobby of The Hilltop Inn in Pullman, WA. The workshop concludes at 11:00 AM on June 7, 2019. Travel to and from Pullman, Washington. Items of a personal nature. Alcoholic beverages. Travel and trip cancelation insurance. Anything not specifically listed as included. Your deposit of $1,495 will hold your place on this workshop. The balance of $2,000 will be due not later than March 1, 2019. All of our standard terms and conditions apply. Need special payment arrangements for your deposit? No problem, just ask us. This workshop is a perennial sell-out. If amazing landscapes in one of the most beautiful parts of the US interest you, if you are looking for amazing rural scenes from sunrise to sunset and beyond, then click the "Sign Me Up!" button and we'll see you in The Palouse!